4256 Private James Alfred Mortimore of the 1st Regiment of the Australian Pioneers. Son of Elias and Matilda Ann Mortimore, of Brook Cottage, South Zeal, Okehampton, Devon, England. Born at Princetown, in 1882. Died 15 June 1916 aged 34. Captain Hugh Fanshawe Glanville of the RAF, 2nd Training Depot Station at Gulanne, East Lothian. On 23 May 1918, there was an accident while he was on a training flight with a pupil in an Avro540 serial D44. He died next day - 24 May 1918 in the VAD Hospital on the airfield from the injuries he had received, aged 34. Before joining the RAF in January 1913, he served for 8 years in the 1st West India Regiment and was mentioned in Despatches. He was the younger son of the Rev. 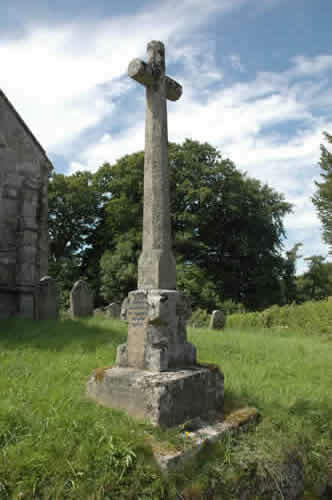 O. F. Glanville of South Brent and his wife Emily (née Lovell) ; husband of Beatrice Gertrude (née Savory) and is also remembered on the War Memorial there. Born in Chertsey in the December Quarter of 1884. 548733 Trooper William John Rowse of the Royal Armoured Corps, 'B' Squadron of the Staffs Yeomanry. Son of Jonah and Elizabeth Rowse, husband of Ursula Mary Rowse of Throwleigh. Born in Throwleigh in the December Quarter of 1909. Died 6 June 1944 aged 34.